A Radio 1 breakfast show listener today (Wednesday January 23) claimed the Battle of Hastings never happened and called the Bayeux Tapestry the first recorded example of ‘fake news’. A listener called Matt called DJ Greg James during part of the show called Unpopular Opinions where listeners are invited to air their views. On today’s show, Matt said: “The Battle of Hastings never happened. “It definitely did not happen. The only proof that you’ve got is the Bayeux Tapestry and that is absolutely fake news. After he was pressed by a shocked Greg James, Matt said he was basing his opinion on ‘lots and lots of facts’. When asked to present these facts, he said: “Our King Harold had a fight all the way up in Yorkshire didn’t he? He fought the King of Norway or something – sent him packing. “Marched his army that had already taken a bit of a hiding all the way down to Sussex. “He gets there, William the Conqueror is sat in his house. And William the Conqueror has said. ‘Do you really want to go again?’ and King Harold said, ‘No I don’t’. “William the Conqueror said, ‘I’ll tell you what, we’ll have the Bayeux Tapestry sewn together, make us both look good. You can take an arrow to the eye, I fought your army off, everyone’s a winner. We don’t have to go toe-to-toe in Hastings again’. An unconvinced Greg James said he ‘admired’ Matt for his ‘true unpopular opinion’ as he had never heard anyone hold the same opinion. 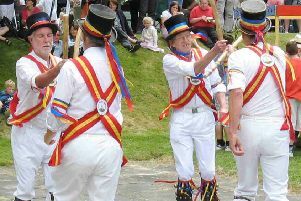 Hastings Morris dance sides set to celebrate St George’s Day. Other listeners were less impressed. Rob, who texted the show, described Matt as ‘an absolute moron’ while another listener found it incredible that the first recorded example of fake news was the Bayeux Tapestry. In order to ‘put Matt straight’, Greg James tracked down historian Dan Snow and invited him onto the show. Disproving the theory, Dan told Matt: “Do you know what, you’re completely wrong. “There is one little interesting thing there in that Harold’s brothers kind of agreed with you. Harold did get back from the north – Battle of Stamford Bridge where he smashed the greatest Viking of the era Harald Hardrada – and he got back to London and he said, ‘Don’t go and fight William, you’re too knackered, you haven’t got a big enough army yet’. But Harold ignored them and marched down to Sussex and there he defeated William. “And if they were just riding on the Bayeux Tapestry then we’d ask the question of how reliable is that. Unfortunately for you buddy, there are several other sources. You would have to disregard a gigantic church built on the spot where Harold was killed by William the Conqueror and you’d have to disregard one of the most important sources in early medieval history which is the Bayeux Tapestry.